About three weeks previous I found myself at my wife's bookshelves once again. I was looking for a book that might help distract me from my shirking of duties regarding The Briar King. (I stopped reading Briar King about halfway through January this year.) There was plenty on the shelves to choose from. After all, the No Book Unread Project is still young. I considered my options. I could read another R.A. Salvatore book, Jennifer has twenty plus books by him which probably translates to roughly a half dozen series. Then there is the werewolf series, the one about Mercedes Thompson, written by Patricia Briggs. I read the first one in that series but hadn't bothered to pick up the next one yet. Of course I could always start the Kushiel series that Jennifer so adores; a series that always results in my lovely wife staring tiny daggers inscribed with 'why can't you be that romantic?' at me for the following week. I decided to take a pass on that one for the time being. I also considered the next Pern novel, but I enjoyed the sci-fi elements of Dragonsdawn so much that I an reluctant to pick up the next book, which is supposed to be more fantasy-esque. Finally, a thick tome with Dragonwing scrawled down the spine called out to me. My eye had caught it repeatedly but I kept dismissing it out of a sense of obligation to some of the other series Jennifer had been herding me toward. In true "me" fashion, however, I inadvertently ended up with one of the few books on her shelves that she had never actually finished. Sorry, love. 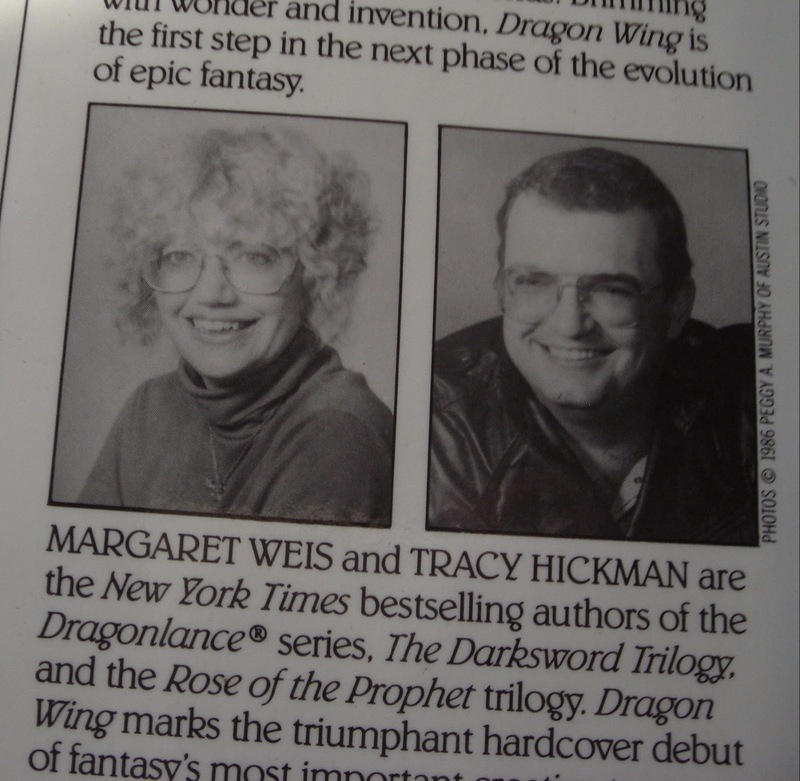 Dragonwing is the first book in the Death Gate Cycle series written by joint authors Tracy Hickman (guy) and Margaret Weis. 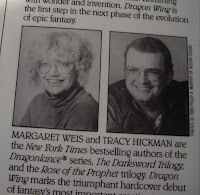 Unbeknownst to me, at least until my wife informed me in a moment of realization, was that the authors of Dragonwing are well-known for another series. Their series is legendary, spoken of only in reverent tones and whispers by fantasy aficionados. You may have heard of it: the Dragonlance series. Seriously I have heard nothing but praise for that series, though I have yet to read it. 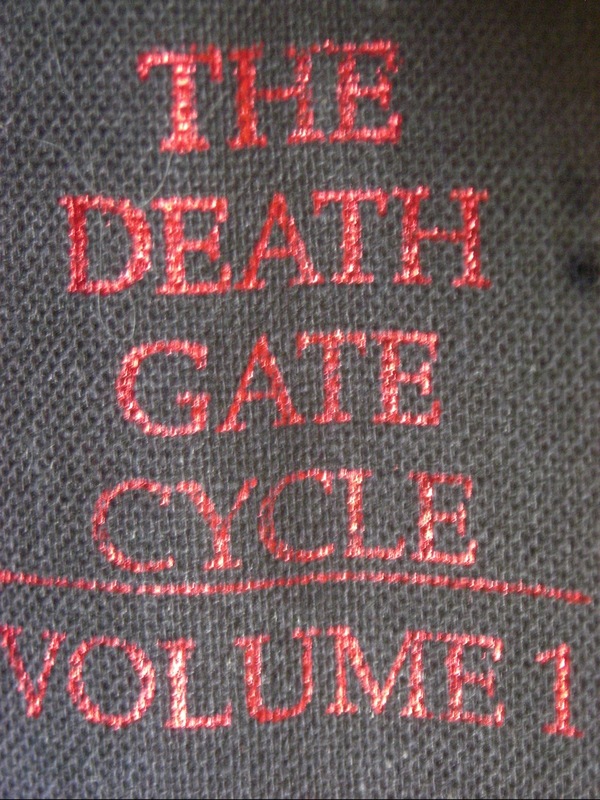 While I can't speak to Dragonlance yet the first book of the Death Gate Cycle was excellent from start to finish. 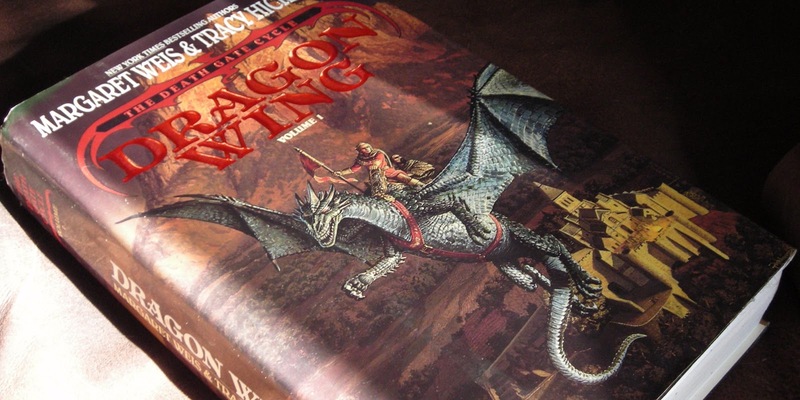 Unlike many other fantasy stories I've read Dragonwing is very clearly high fantasy. In fact the setting is pretty much my textbook example of a high fantasy. The world is sundered, comprised of a series of floating land masses shaped by ancient magics. Populating the scattered floating islands are the fantasy big three: humans, elves, and dwarves, while two sects of absurdly powerful magic-users lurk in the background. The humans, occupying the middle realms, remain locked in constant conflict with the elves. Tenacious and ingenuitive (of course) the humans tame dragons in order to traverse the floating archipelagos and combat the elves. The elves on the other hand, occupying the upper realms, have no such ability but rule the skies using magically controlled airships. As for the dwarves in the lower realms? Well, for now, let's just say they don't get out much. The setting of Dragonwing portrays a rigidly stratified class system, quite literally divided by upper, middle, and lower classes. The different classes are embodied by each race and mirror their position within the realm of sky-suspended territories. Dwarves, at the bottom, labor and toil attending to a sort of living machine known as the Kicksey-Winsey, believing those living above them to be gods. Unbeknownst to the dwarves who live in the midst of an unending maelstrom, their efforts support the relatively comfortable lives of those above. The dwarves provide water which is scarce throughout most of the world, yet common in their homeland due to the constant storms. The elves, by benefit of their airships and their perceived godhood hold a monopoly over the water produced by the dwarves and the Kicksey-Winsey. The story follows several protagonists, jumping between their points of view and slowly weaving their journeys together. What I find interesting is that, arguably, only one of the characters is actually good in any normal sense of the word. Hugh the Hand, a human assassin is the first one introduced, followed by Limbeck, a dwarven visionary in search of the 'truth'. Then there is Bane, a cursed human child wanted dead by a King in the human realms, Alfred, Bane's bumbling servant, and Haplo a mysterious man from another world. The charm of Dragonwing is that you really have no idea where the story is going to end up. You end up following a handful of characters who each has their own schemes and agendas who only superficially trust those around them, and of whom each has their share of issues. The journeys play out as an adventure-filled sojourn fulled with a tangled web of schemes against the backdrop of a mysterious and shattered world. Unlike a lot of other epic fantasy-filled journeys, however, there is a distinct absence of camaraderie. There is a sense that at any moment everything could erupt, a result of the sort of character-driven cold war that permeates the pages. There is a theme of being bound to the past too which seems to stick out. All of the main characters seem to be haunted by something in their past that they can't escape, save for Limbeck. Even Limbeck, though, if in a more round-about way is affected by the past, tied to the shattering of the world that resulted in his people, the dwarves, trapped in a life of thankless servitude. Overall, I really liked Dragonwing but I find myself at a loss of words beyond that. The writing is solid and nothing sticks out as dubious or half-conceived. The characters are believable and deep. I'm tempted to call this Anne McKaffrey Syndrome as a throwback to when I discussed Dragonsdawn and found myself at a similar loss. 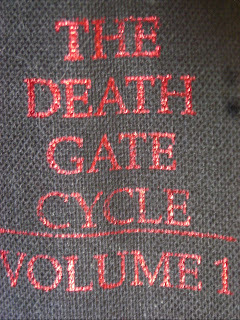 All-in-all I'm really excited to see where the Death Gate Cycle series goes. We have the first three books in the series but there are apparently more even beyond that, and each book weighs in at over 400 pages. I feel that, inevitably, I'll end up getting the other books at some point during the project. My reading list yet grows. *Post-review Notes: I'm not particularly happy with how this post turned out for some reason, although I can't explain why. I thought about trying to fix it but after reading through several times I couldn't decide where I should start, short of scrapping the whole thing and starting from the beginning. I've been experimenting with writing my posts out on paper first before copying it to the computer. I feel my writing is slightly better that way but at the same time... after copying everything over I'm not sure what to revise though. The whole reason why I tried writing on paper first was because I was hoping to do a draft and then a polished final after transfer. Hmm, frustrating. **Other misc. notes: Hugh the Hand was my favorite character, even though I liked all the major characters. Once again, though, something horrible happened to the one I liked the most. This is Dragonsdawn all over again. Also, the villain towards the end of the book? He was too evil. I'm not sure how that's possible...but it he was almost comically evil, just because of how extreme he was. In retrospect I should have mentioned these things in the discussion but I'm too tired to go back and add it in now. Oh, and did you check out the author picture? Holy hell do those pictures look old. I know the book came out in 89' (the year after I was born) but those pictures did not age well. Maybe it's the fact that they look like old class portraits.